My family and I recently had an opportunity to spend a week’s vacation on Longboat Key Florida. We originally thought we would stay on Siesta Key because of a recent story, America’s Best Beaches List by Dr. Beach, that said it had the second best beach in the US based on water and sand quality. While I’m sure it has lovely sand, we weren’t crazy about the accommodations we found and we heard the island was really overcrowded, so we decided to book a stay on Longboat Key where we found Cannons by the Sea Cottages, a group of four one- and two-bedroom bungalows that we fell in love with. We were so close to the Gulf of Mexico we could hear the waves at night. The beach was spectacular, right out our front door, wide and very private, and there was always a gentle breeze. The Gulf could not have been more beautiful, clear and blue, the color of Windex. My husband and I spent our time shelling and relaxing while the kids played in the water, discovered all kinds of sea creatures and built sand castles for hours on end. It was so convenient to be able to walk the short distance to our cottage to escape the sun for a while, catch a nap or read another chapter while lazily swinging in our hammock. Longboat Key has some truly great restaurants and we sampled one or two, but we loved having our own kitchen, and that allowed us to eat whatever and whenever we wanted. And it saved us a lot of money. We’ve already reserved our cottage for next year and can’t wait to go back. Siesta Key may be number two, but to us, Cannons by the Sea Cottages on Longboat Key Florida is number one! Previous post: Looking for the perfect Florida Vacation Rental on a beautiful resort island community? We have beach vacation rentals for you right here on Longboat Key. 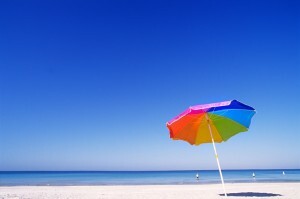 Next post: Summer Beach Affordable Vacation at Cannons by The Sea Cottages.